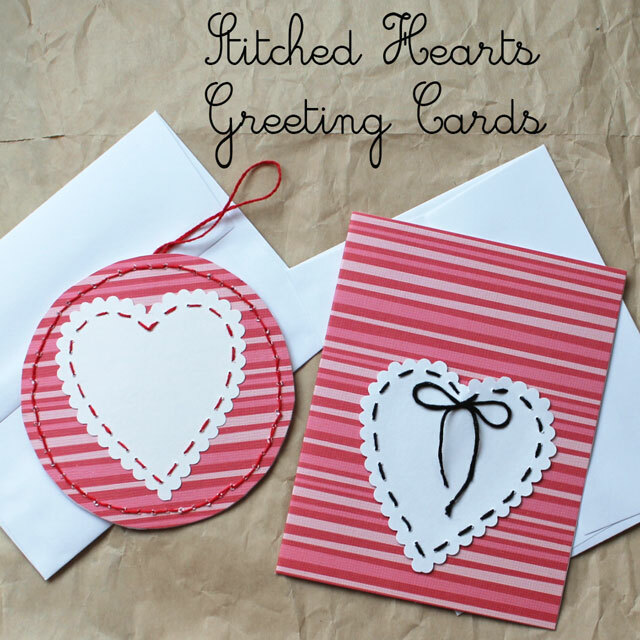 We have two ladies in our lives celebrating birthdays around Valentine's Day, so I decided to make them each a Birthday and Valentine Card combination, by stitching them up some hearts. 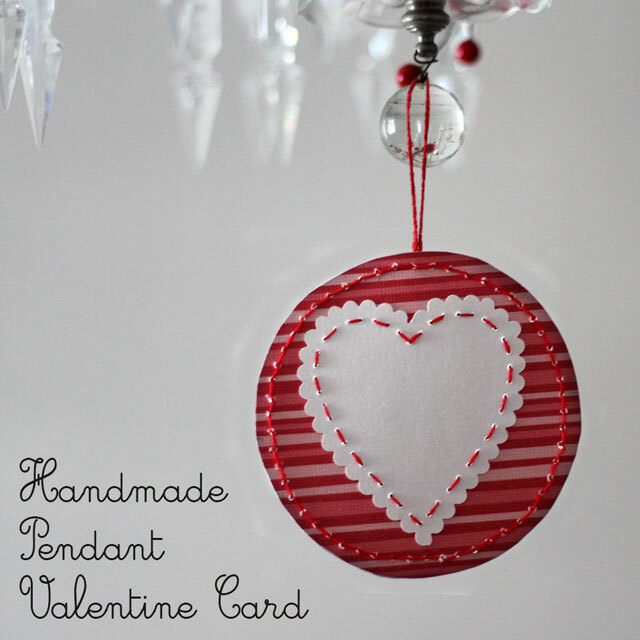 One is a two-sided pendant card and the other is a standard style greeting card. I've added a new tool to my card-making supplies - an awl. It's a bit nuts, but I love that thing! So handy for punching holes, that act as guides for where to stitch and make passing the thread through the paper easier. So if you have an awl, get it out. If you don't but like stitching on paper, I highly recommend you get one. I found mine during this shopping trip to the fabric and notions shops on Queen Street West. But, if you don't have an awl, no problem ... just use a push pin, and maybe a light tap of a hammer if required, instead. - One pre-folded patterned note card. I got mine in a box of 50, complete with envelopes, at a big bookstore (Chapters Indigo) in the card/stationery section of the store, but you can use a flat piece of patterned card stock that you fold yourself too. Look for paper that is meant for scrap-booking. - Some white or cream coloured card stock. - Fancy edge scissors are optional but add a nice touch. Look in the children's crafting section of your art store. Mine are by Fiskars and cut really well. - A sewing needle with an eye big enough to thread with embroidery floss. A needle threader is also very handy. 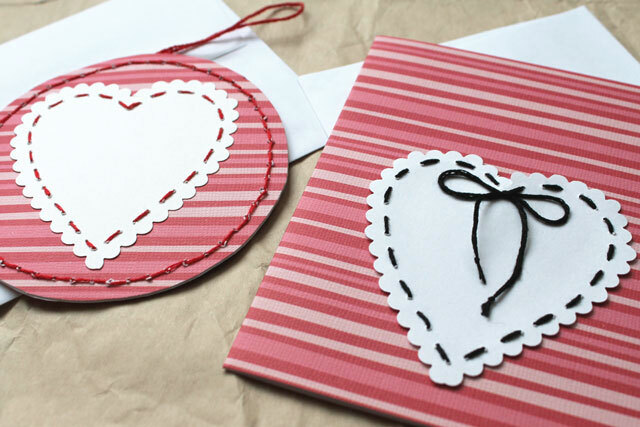 - You'll also need some two-sided tape, regular sticky-tape, regular scissors, a pencil and some plain paper to make your heart and circle templates. 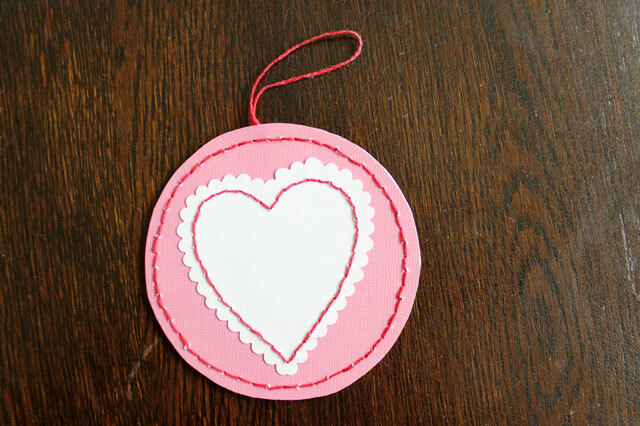 (1) Create a heart shaped template that is slightly smaller than you want your finished heart to be. 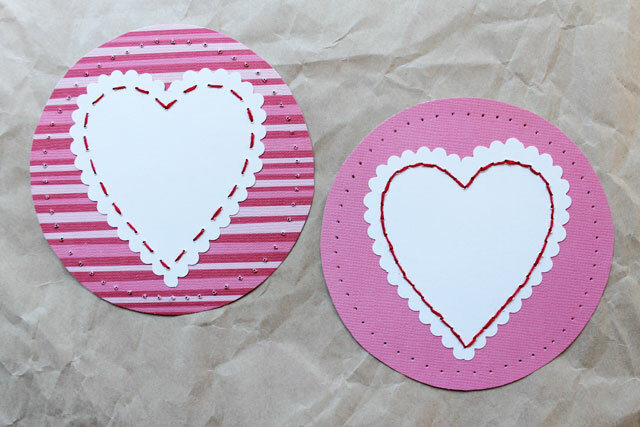 And cut a circular template the same size at you want your finished card to be. 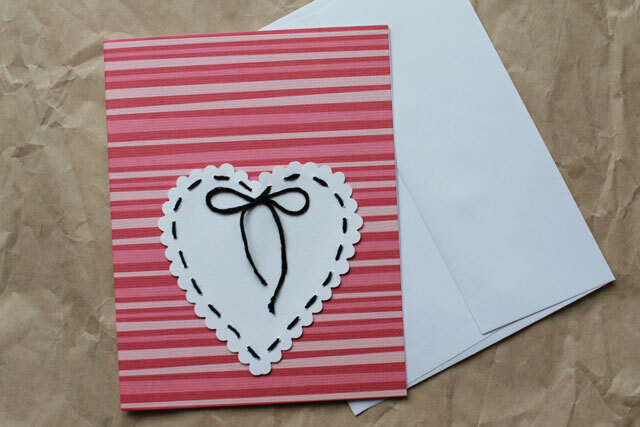 Trace two hearts on the white card stock and the circle on the note card. 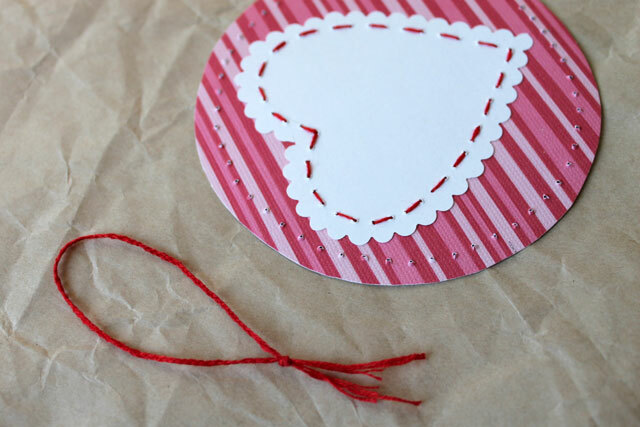 Cut the hearts out, beyond your pencil mark (as the pencil mark will be the guideline for the stitching part. Use your fancy scissors if using, or plain scissors if not. 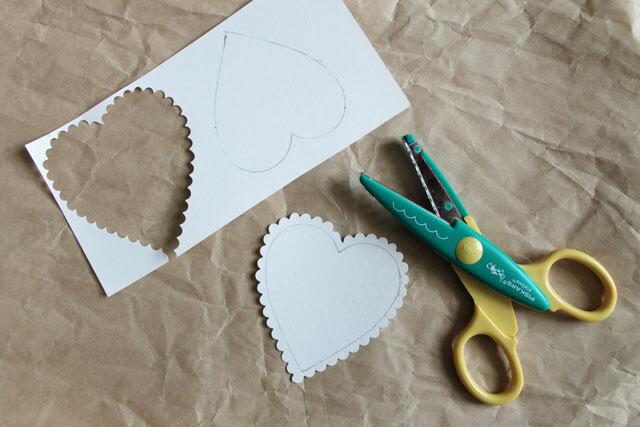 Cut your two circles out of the note card with your plain scissors by cutting through both layers at the same time (so both circles match perfectly). Don't separate those circles yet! 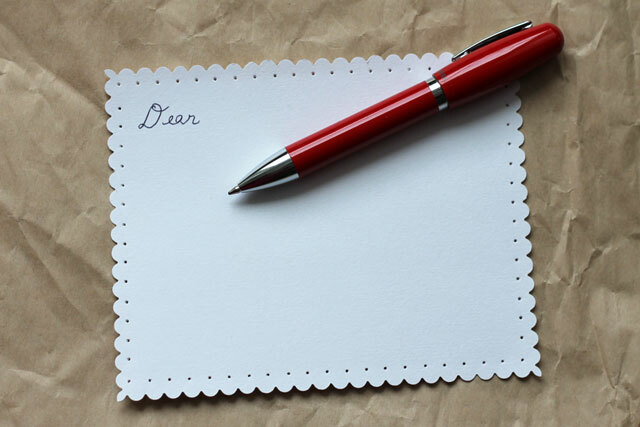 (2) Using your awl or pushpin, poke holes around the pencil line in your hearts. Also poke holes around the perimeters of your circles (still matched together perfectly. MARK one hole on each side so you can re-match your two sides once you separate them in the next steps. 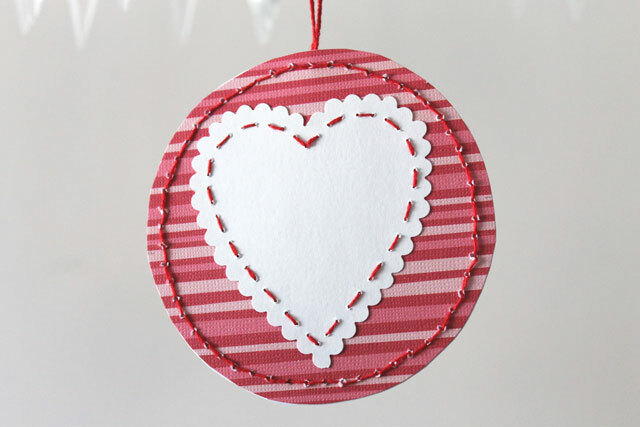 (3) Use a bit of two-sided tape to anchor you hearts to the centre of the circles. 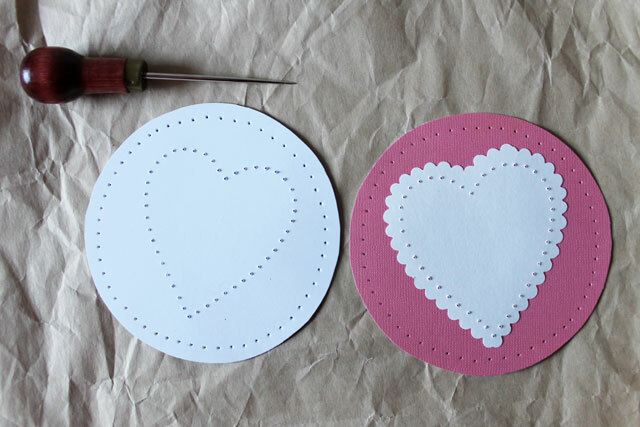 Go back through the holes on the hearts with your awl or pin, so you will know where to pass the thread from the back-side. (4) Using 3 of the 6 threads that embroidery floss normally comes with, and stitch the hearts to the circles, either by just going in and out to form a dashed line (as I did on the striped side) or in and out, and then going around again, in and out, filling in the spaces to form a solid line (as I did on the solid side). Tie knots at the back of each half. 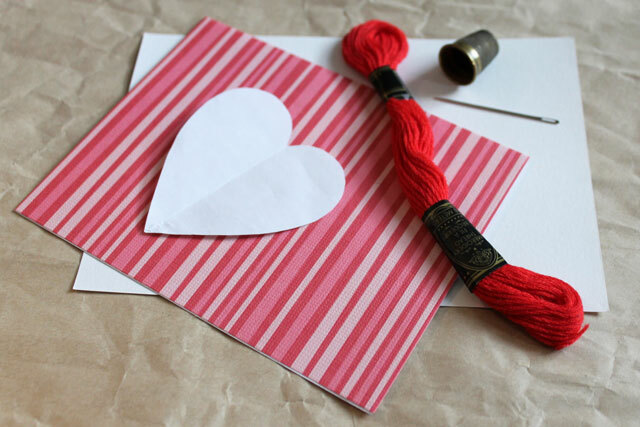 (5) Braid a hanging loop for your card from one piece of embroidery floss, dividing the 6 threads into 3 x 2 to braid. Knot the braid to make a loop. 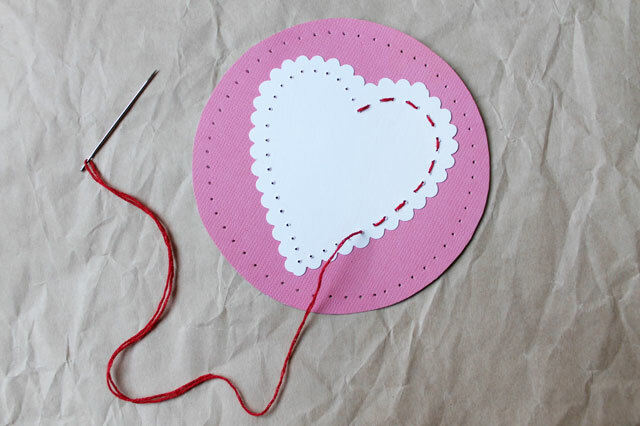 (6) Attach the knotted end of the hanging loop to the top of one circle, by sewing through your pre-punched holes. Match the two circles together, using your previously marked holes to make sure they are exactly lined up. Stitch the two sides together. (7) Since there isn't an inside to this kind of card, you may want to add a note card, which I made by taking a single piece of card stock, cutting with my fancy scissors and poking a border of decorative holes around. But you can just use a plain piece of card stock too. 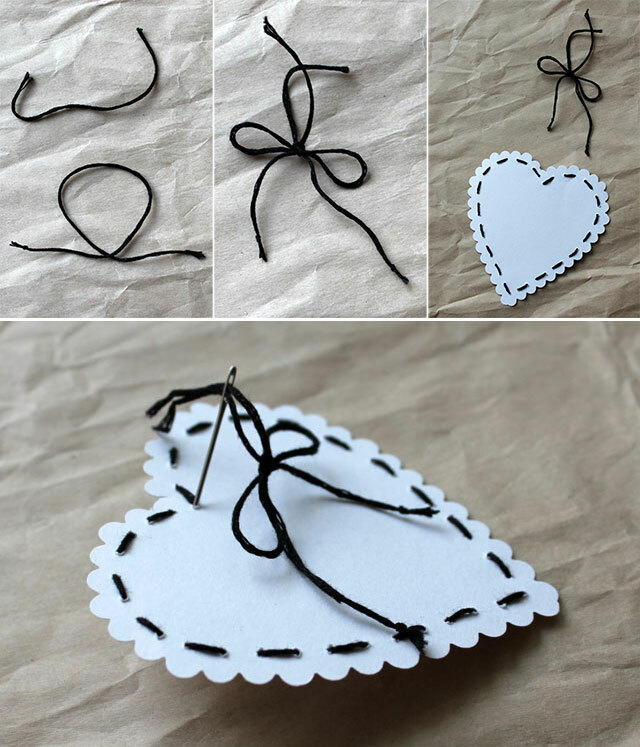 (1) Make a heart the exact same way as described above. 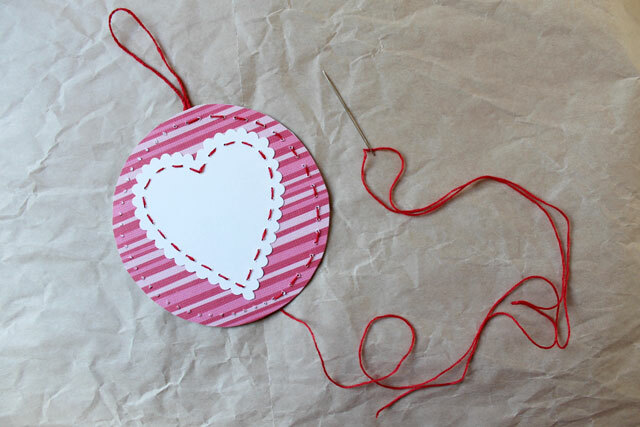 (2) To attach a bow to the front, that hangs better than if you simply tied the ends of your embroidery floss together into a bow, make the bow separately and then attach to your heart. Do this by cutting a length of floss and knotting the ends. Loop it as shown in the photo. Take a second piece of floss and tie it to the loop to make a bow with two tails hanging down. You your needle to attach to your heart. Knot with the threads already on the back of the heart and tape the ends down with regular sticky-tape to make sure they don't show on your finished piece. 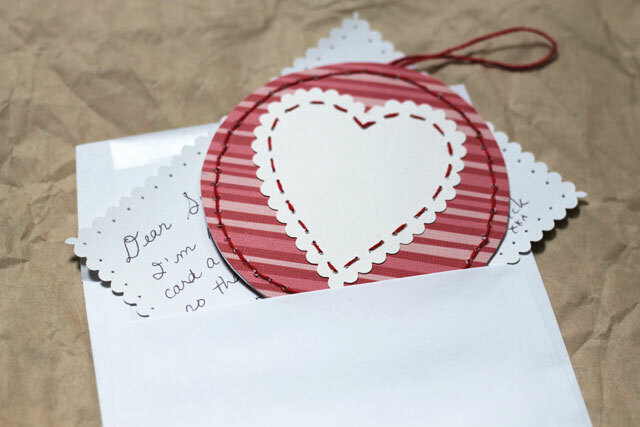 (3) Use two-sided tape to adhere your heart to the greeting card. Thanks for checking out my tutorial. I hope everything is clearly described but if you have any questions, don't hesitate to ask in the comments or via email. That’s a lovely idea. No gift comes from the heart more than something made with love. Just the other day I was thinking that I should try stitching on paper. This post is confirmation! So cute!